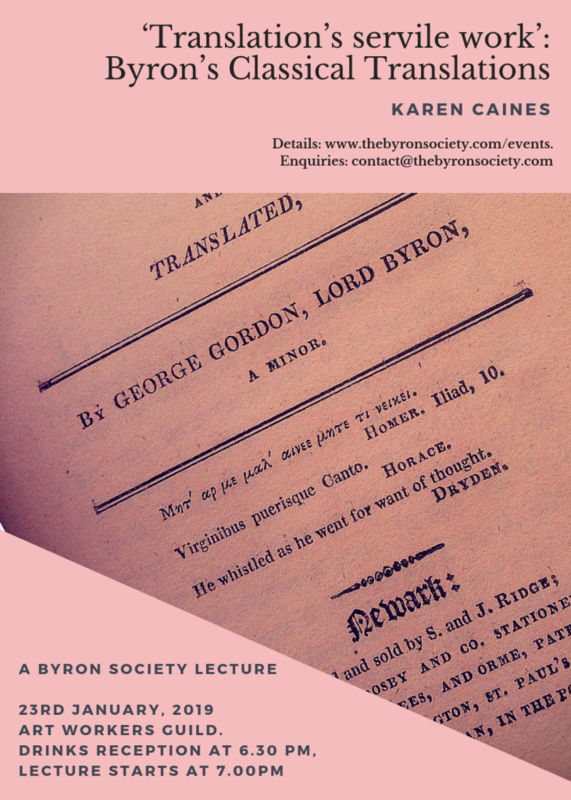 We host a wide range of events, if you are interested in the details of any of our past events, or wish to discuss hosting something similar, please contact us or email contact@thebyronsociety.com. Karen Caines ‘Translation’s Servile Work’: Byron’s Classical Translations. In this talk, Karen Caines (DPhil student, Oxford) examined Byron’s engagement with classical translations over the course of his poetic career. No knowledge of Latin or Greek required. This lecture explored the things Byron might have known about the poetry and life of John Wilmot, second earl of Rochester, some of the things that he did with that knowledge in his own writing, and some of the ways in which Byron’s contemporaries used the cautionary narrative of Rochester’s life to do things to Byron. 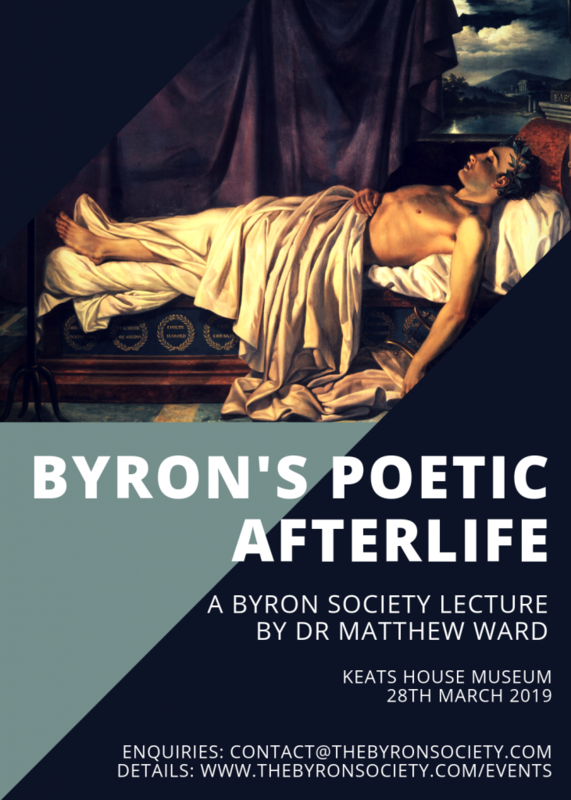 This talk considered the poetic afterlife of Byron in the long nineteenth century, focusing in particular on Matthew Arnold’s criticism and poetry. It reflected on literary inheritance by thinking about the various ways the Romantic influence of Byron is dealt with by those that came after, and how (for better or worse) they resurrect Byron in their writing. 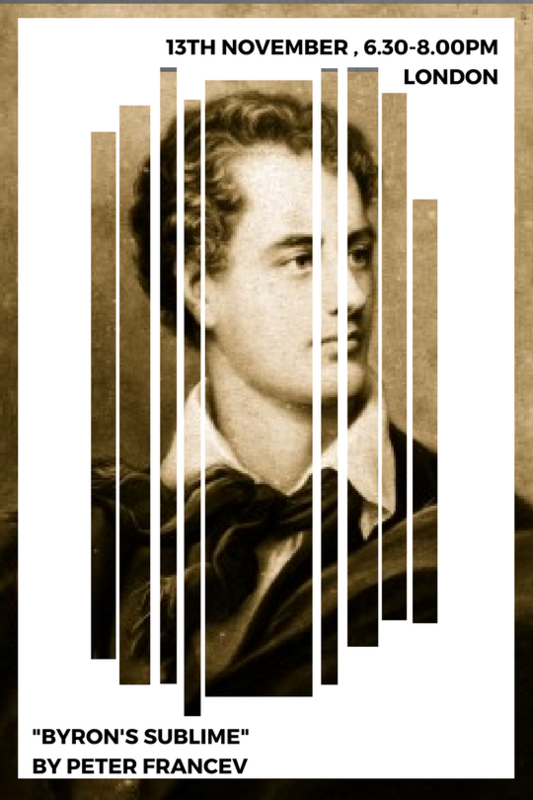 Our members can register for free to attend a two-day symposium on Lord Byron’s literary relationships to poets from Virgil to Auden. In a series of papers by leading scholars, we will be mapping out the range and richness of Byron’s connectivity: what other poets meant to him, and what he meant to those who came after. Join us to explore the ways Byron might be thought to be – perhaps more than most – ‘among’ the poets: alluding and alluded to; collaborative; competitive; parodied; worked and reworked in canons, anthologies and editions. Papers will focus on the contours of individual literary relationships (what did Byron get from Pope? how did Eliot read Byron? ), as well as exploring larger questions about the nature of poetic exchange, technical influence and generic formation. 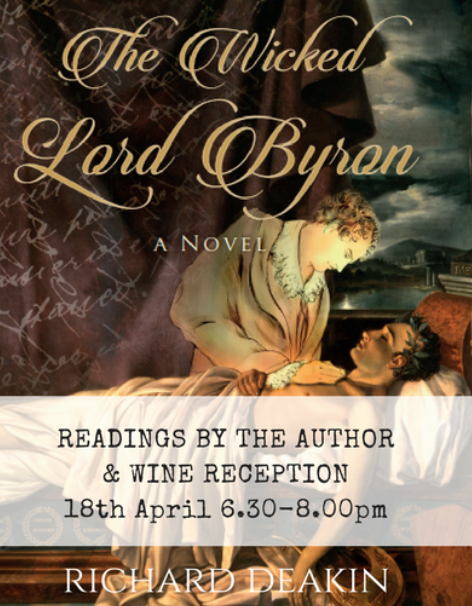 An evening talk exploring the presence and importance of the number six in the life and works of the sixth Lord Byron. This evening lecture looked at the chronology of the mal du siècle, and the value of the term as a way of thinking about Byron’s work before he took the great turn towards Don Juan. Stephen paid particular attention on Childe Harold’s Pilgrimage and the Giaour, exploring the ways in which the maladie du siècle hints at both the challenges and the limitations for Byron. Richard Deakin discussed the inspiration for his novel THE WICKED LORD BYRON, which presents the life story of the poet as he relives it in his final hours, from the point of view of both the laughing dandy and the tragic romantic. Robin, Lord Byron, who wrote the Foreword to the novel, introduced the event. Followed by a talk from Miranda Seymour. 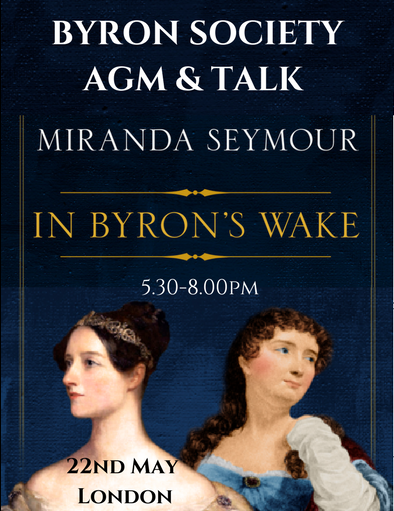 In this talk, Miranda Seymour discusses her new book, In Byron’s Wake, which examines the enduring influence of Byron on both his wife and his brilliant, eccentric child. 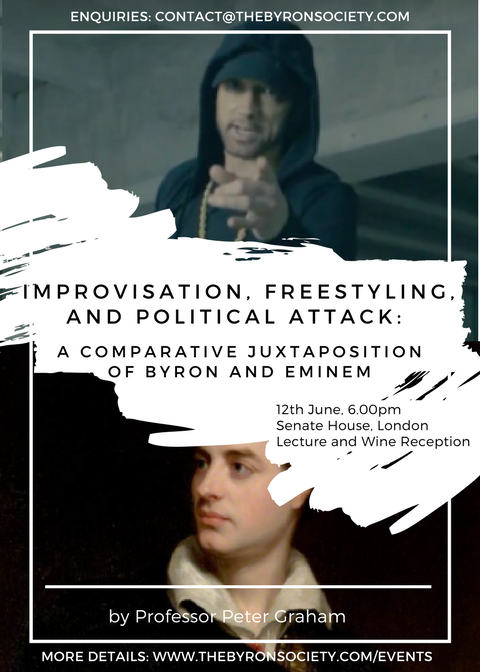 Our Free Public Lecture was a talk comparing Byron and Eminem’s skilful, seemingly improvisational attacks on political establishments and politicians, on Lord Castlereagh in Byron’s Don Juan and on Trump in Eminem’s The Storm. This summer in the lovely environs of Keats House, Professor Phillip Shaw gave our annual joint public lecture with the Keats House Museum. 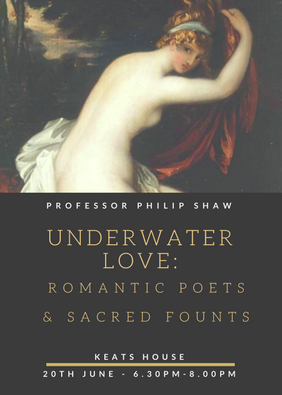 Following a discussion of Byron’s encounter with the restorative qualities of Arethusa’s sacred fount on Ithaca in 1823, the talk explored Keats and Wordsworth’s responases to Ovid’s retelling of this legend. 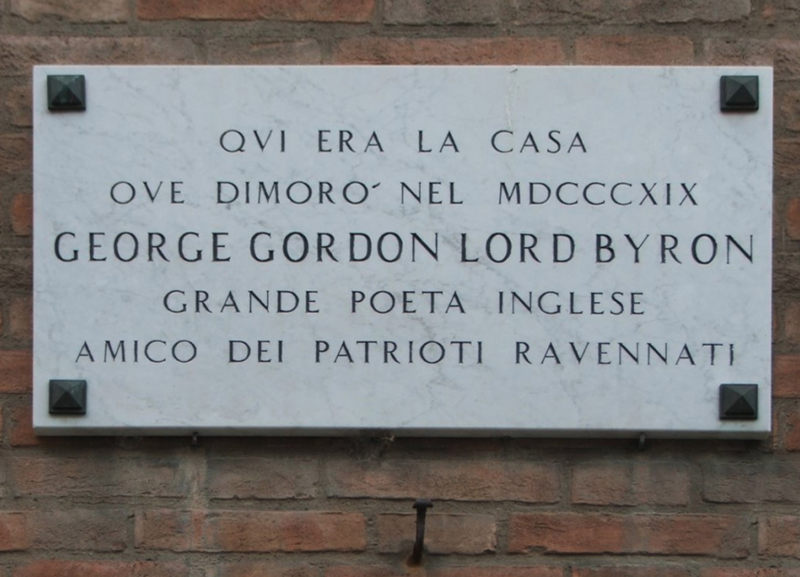 The International Byron Conference at Ravenna, Italy. The conference theme was “Byron: Improvisation and Mobility”. We were delighted to sponsor an event at this year’s St Marylebone Church Parish Festival. 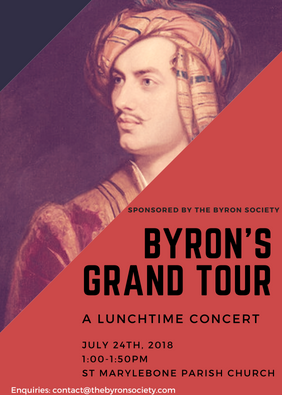 Byron was baptised at the St Marylebone Church in 1788, and in celebration of this, there was a lunchtime concert celebrating his Grand Tour across Europe, with readings and songs. We travelled to Nottinghamshire and visited Newstead Abbey and the Annesley Churches. Speaking in the imposing surroundings of Byron’s own home, Dr Christine Kenyon Jones gave a lecture titled “Fact, fiction and entail: the cases of Byron and Jane Austen”. 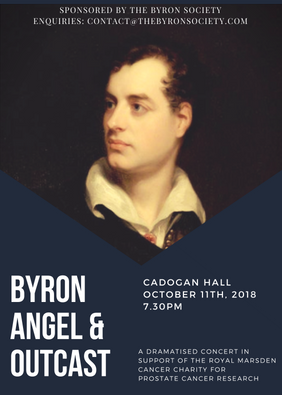 An evening lecture on the unique ways in which Byron incorporates various modes of the Sublime, exploring the works of those who inspired him, and the influence these ideas had on Byron’s poetry. 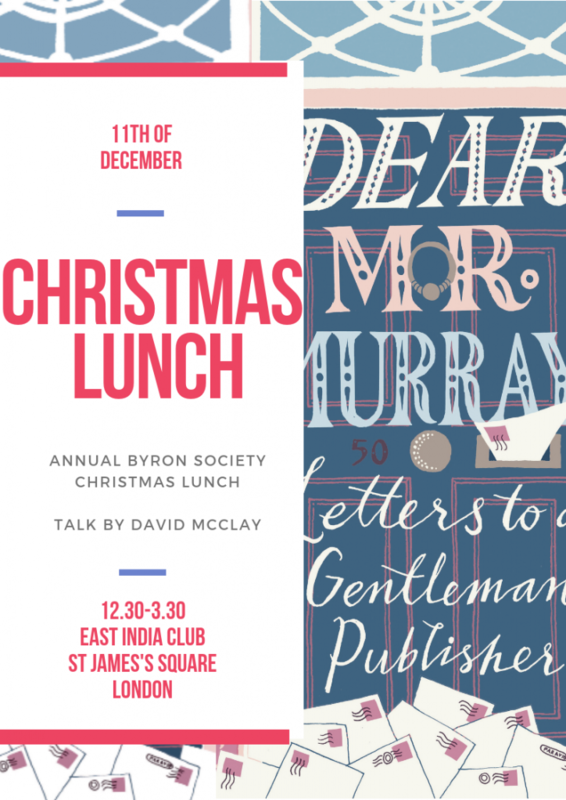 At our brilliant Christmas lunch, David McClay gave a talk about his new book, Dear Mr Murray. The publishing house of John Murray was founded in Fleet Street in 1768 and remained a family firm over seven generations. A celebration of John Murray Publishers 250th anniversary this year, Dear Mr Murray is a collection of letters from the Publisher’s archive. 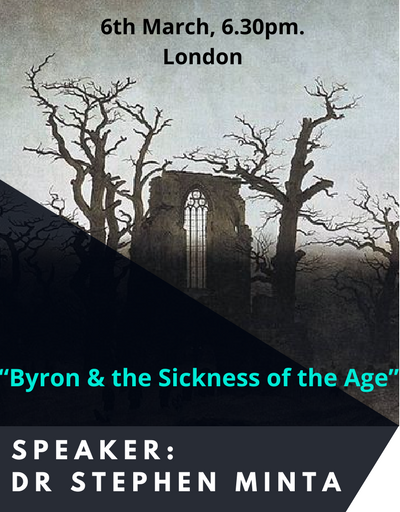 Dr. Anna Camilleri of Oxford University is to give a talk to the Society on ‘Byron and Heroism’. The lecture will take at the Art Workers’ Guild, 6 Queen Square, WC1N 3AT. There will be a reception prior to the talk at 6.30 pm, which will commence at 7pm. Daniele Sarrat of the French Byron Society is to give a lecture to us entitled: ‘Such immortal fire, love for Byron and life of his works through French Romantic Artist from 1819 -1863′. The event will take place at The Art Workers’ Guild, 6, Queen Square, WC1N 3AT at 6.30. The talk will be preceded by a wine reception. For those who wish dinner will be arranged at a nearby restaurant after the event. The cost of attending the lecture is £5, the dinner £25. 13 March there will be a poetry reading at the Art Workers’ Guild, 6, Queen Square WC1N 3AT. Short poems and extracts by Byron, or one of his contemporaries, will be chosen by members and read by them. The event will begin at 6.30 and include not only a wine reception, but sandwiches and other light food. The cost of attendance is £10, including food and drink. 11 May, joint venture with Keats House, reception 6.30, lecture 7 pm. Tickets £7, available through Keats House, Eventbrite or the Byron Society. 23 May Art Workers’ Guild, AGM, followed by a reception including sandwiches, and a lecture from Professor O’Neil of Durham University (title to be confirmed in due course). 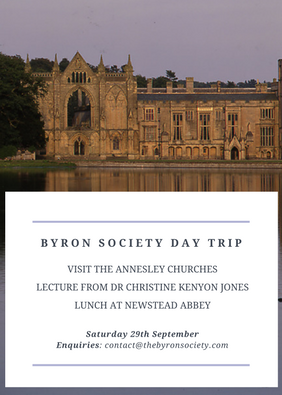 It is quite a few years since the Byron Society visited Newstaed Abbey and I am very pleased to say that we have arranged a visit, in conjunction with the Newstead Abbey Byron Society, for Saturday 2 September. We hope as many members as possible will wish to attend. Guests of members will also be welcome. We would like to invite you to our upcoming Byron Society Lecture by Professor Rolf Lessenich, Professor Emeritus of English (and Comparative) Literature, Bonn University. Please join us at our Upcoming Lecture by Dr Joselyn Almeida-Beveridge, ‘Byron and Southey in Epic Contest’. Dr Almeida-Beveridge is Associate Professor in the Department of English, University of Massachusetts. Venue: the Art-Workers’ Guild, 6 Queen Square, SW1. Time: 6.30 for 7.00pm. Drinks will be served. £6 for members and guests. Please contact the Director if you wish to attend. Our annual Christmas lunch, with guest speakers. £30 for members and guests. Venue: the East India Club, 16 St James’s Square, SW1. Please contact the Director if you wish to attend. 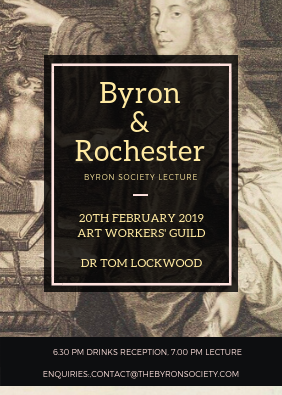 Jonathan Shears’ talk on Byron’s Hypochondria on 13th January at the Artworkers’ Guild, 6 Queen’s Square WC1N 3AT at 6.30pm. There will be a wine reception before the lecture and dinner will be arranged for those that wish after the event at a nearby restaurant. £5 to attend the lecuture and £25 to attend the dinner. Payable on the day or in advance, please let me know if you wish to either or both of these events. Josefina Tuominen-Pope will give a talk on ‘Byron, Celebrity and the Romantic Media’. The event will take place at The Art Workers’ Guild, 6 Queen Square, WC1N 3AT at 6.30 pm. The talk will be preceded by a wine reception. Dinner at a nearby restaurant will be arranged for those who wish. The cost of attending the talk is £5 payable in advance or on the day. The cost of attending the dinner will be £25. The talk will take place at The Art Workers’ Guild, 6 Queen Square, WC1N 3AT at 6.30 pmThe talk will be preceded by a wine reception and dinner will be arranged for those that wish after at a nearby restaurant. £5 to attend the lecture £25 to attend the dinner. Payable on the day or in advance, please let me know if you wish to attend either or both of these events. This is a joint event with Keates House on 26 April from 6.30 pm, at 10 Keats Grove, Hampstead NW3 2RR at 6.30 pm. Bernard Beatty is to talk on ‘The London of Wordsworth, Keats and Byron’. Please book through Keats House if possible, although the Society has reserved some seats which are available for purchase through the Director on a first come first served basis. The cost of attendance is £7 payable to Keats House. The Society will arrange dinner for those who wish at a nearby restaurant at a cost of £25 a head after the talk. May 24th The AGM 5.30pm, followed by drinks and sandwiches, and a talk at 7pm by Alan Rawes on ‘Byron’s Love Letters’, free to members. At the The Art Workers’ Guild. 6, Queen Square, WC1N 3AT. June 22nd talk from David McClay will talk about the new joint exhibition held between the National Library of Scotland and Abbotsford on Scott as a literary reviewer of Byron’s Childe Harold among other works. 6.30pm at the The Art Workers’ Guild, 6 Queen Square, WC1N 3AT. There is to be an expedition to Dr Johnson’s House and talk by Dr Anthony Howe of Birmingham Universtiy on Aspects of Dr Johnson and Byron. Visit the house from 4.30pm, the talk and reception will be at 5.30pm. At 17 Gough Square, London EC4A 3DE. Cost £10 per head, payable in advance or on the day. Dinner will be arranged at a nearby restaurant for those that wish at a cost of £25. 12 September Visit to Abbotsford: joint event with the Scottish Byron Society, full details will be confirmed in due course. The Art Workers’ Guild 6, Queen Square, WC1N 3AT at 6.30 pm. On 3rd October 2016 there is to be book launch at King’s College, London. ‘Byron: The Poetry of Politics and the Politics of Poetry’ edited by Roderick Beaton and Christine Kenyon-Jones. The book consists of essays from the Conference held by the International Association of Byron Societies in London in 2012. There will be a reception to accompany the launch. Further details will be given nearer the event. 18 October – It is “An Education in Adultery: Don Juan a moral Tale”. It is on 18 October and given by Emily Patterson-Morgan. The Art Workers’ Guild 6, Queen S quare, WC1N 3AT at 6.30 pm. It will be £5 to attend the lectures and £25 to attend dinner which will be arranged at a nearby restaurant for those that wish. Payable on the day or in advance. The AGM will be free and the reception will include sandwhiches. ‘Making Public Display of Lord Byron’. 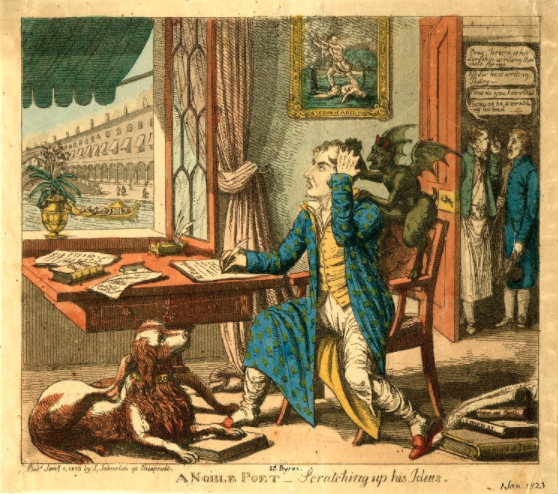 17 February Geoffrey Bond: ‘The Art of Writing about Byron’. 25 March Professor Richard Cardwell: ‘She Walks in Beauty like the Night’. 22 June Christine Kenyon-Jones on Byron and Jane Austen. 9 September A Walk on the Wild Side: Lord Byron’s London. The starting point for the walk is at Green Park Underground Station by the Diana Fountain (parkside exit of station). We finish at Hyde Park Corner. The cost of attending the walk will be £5. For those who wish, dinner will be arranged at the Rose and Crown, Old Park Lane at the conclusion of the walk at an approximate cost of £25. 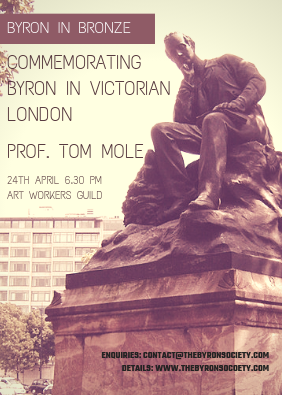 We’d love as many of his friends, students and fellow Byron scholars to take part as possible. Please let us know if you’d like to write, read or perform anything. The above two events will take place at The Art Workers’ Guild, with a reception at 6.30 pm and the talk beginning at 7 pm. Dinner will be arranged at a nearby restaurant for those who wish after the event. The cost of attending each talk will be £5, the cost of attending a dinner after the event will be approximately £25. Dates of other events, will be given in due course.